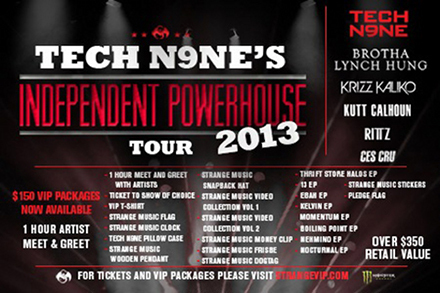 It’s no secret that Strange Music has gotten to where they are by putting on one of the best live shows in hip hop. But is it possible to improve on perfection? According to The Smoking Section, it is. The Smoking Section checked out The Independent Powerhouse Tour’s appearance in Detroit and the response was nothing less than one of reverence for Strange Music’s ability to shut it down. After seeing artists perform four or five times, you’d think their stage show would grow old. While that may be the case for many underwhelming modern MCs, Tech N9ne continually raises the stakes for live performances with every one of his nearly seasonally, marathon tours. So even if you’ve had the Tech N9ne Experience more than once, you know now there’s always a reason to do it again. Strange Music: it goes up.